Dual Jade Green Colour Lenses Or Army Green, as the name suggests, feature a dual-layer colour pigment, instantly making your eyes look bigger and more attractive. These lenses provide more colour definition and deeper contrast than standard single-colour lenses. These lenses are suited to those wanting a more vibrant, richer colour change. 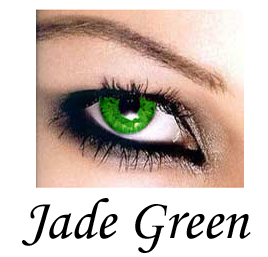 Nothing is more striking and unusually beautiful than bright jade green eyes like that of Poision Ivy’s. Now, you can look just as captivating and fascinating with Coco Contact’s Dual Jade Green lenses. Its dual-layer makes the color stand out better than single-colored lenses. Draw attention to your eyes with a pair of Dual Jade Green contacts.